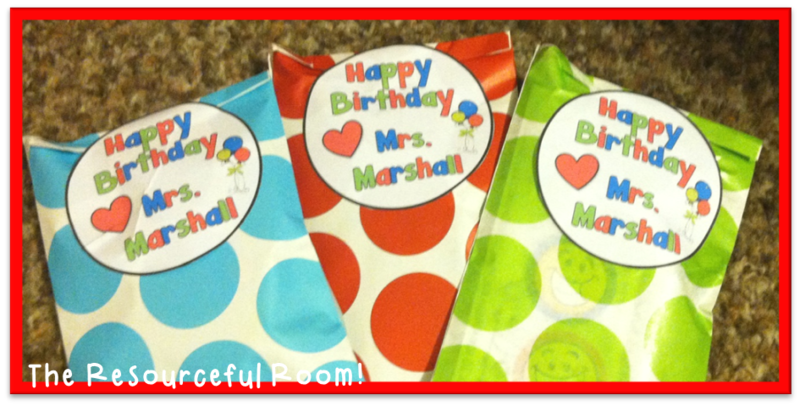 Celebrating Birthdays in The Classroom! - The Resourceful Room! Celebrating Birthdays in The Classroom! I've always liked to celebrate student birthdays but I've struggled to make sure it was consistent for all my students. This year I started searching for some inspiration on other blogs and found a couple of posts by Kacey at Doodle Bugs Teaching. I loved how she had something ready to go that she could give to each student on their birthday and she made it special. So I decided to make birthday bags. 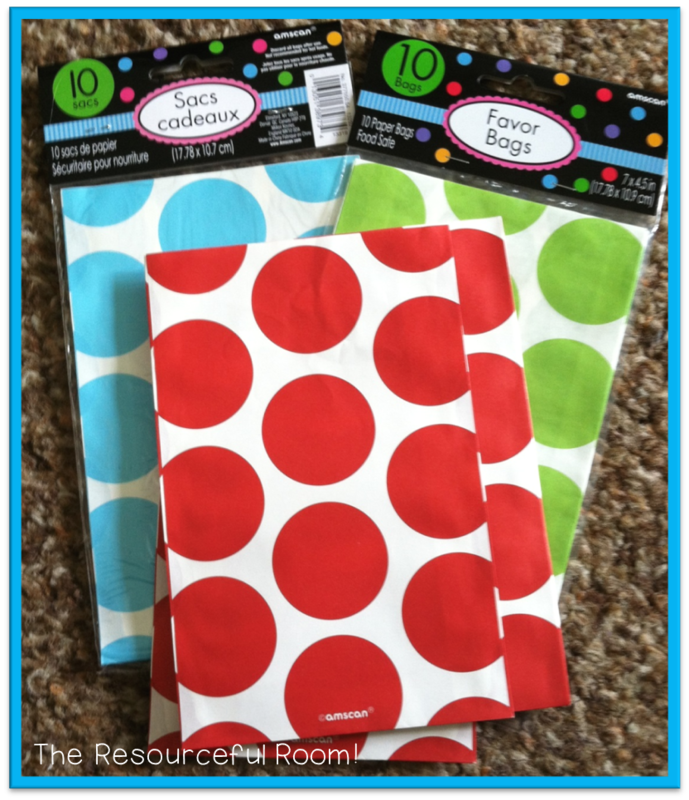 I picked up these cute treat bags at Party City, they match my classroom colors perfectly! 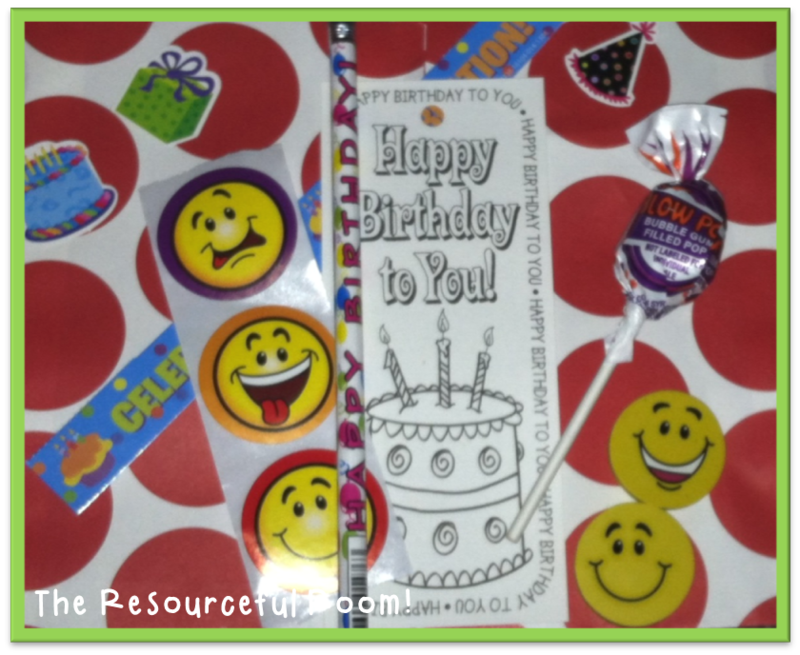 I ordered some smiley face stickers/erasers, and birthday pencils from Oriental Trading. I got the birthday "celebration" bracelets and suckers from Dollar Tree. The color your own book marks are from Barker Creek. I made these labels to put on each bag. I printed them on full sheet label paper then cut each one out. I stuffed each bag with the goodies and attached a label to them! 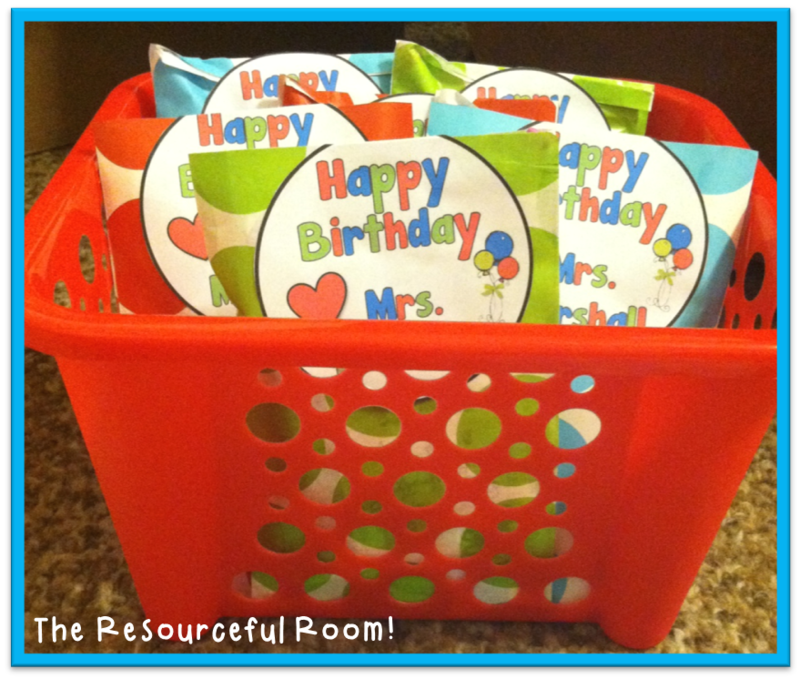 I put them in a basket, and they are ready to go whenever someone in my class in turning another year older! They turned out so cute, I can't wait to celebrate with my students on their days! I love being prepared and not having to scramble when I see a birthday is coming up! 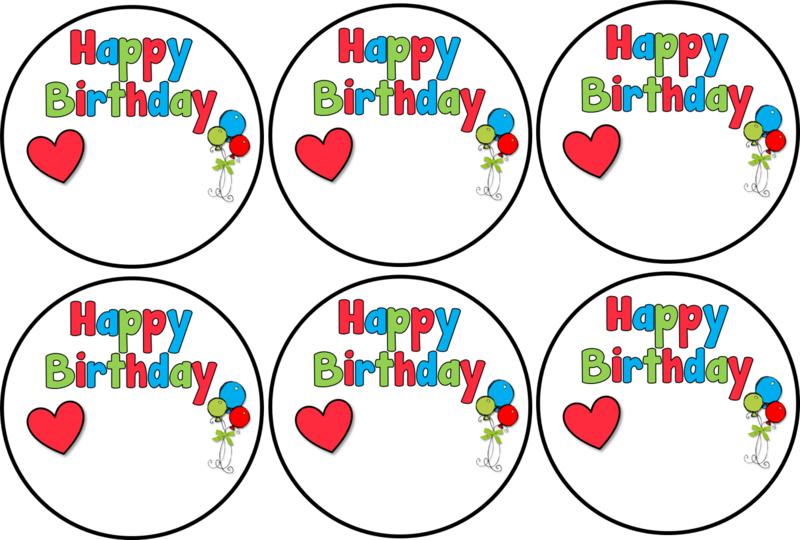 Here's the birthday label for you! Just add your name, print on label paper and you will be all set to create your own little treats! Thanks for reading! Hope you have a wonderful day! I did something similar this year too! It's such a time saver! Great idea! I love the birthday labels you made. Just wondering what font was used so that I can download and use the same font. I can't wait to use these next year! Thanks for a wonderful idea. Enjoy your summer! The font is Janda Manatee by Kimberly Geswein you can find it here free for personal use! These are so adorable! 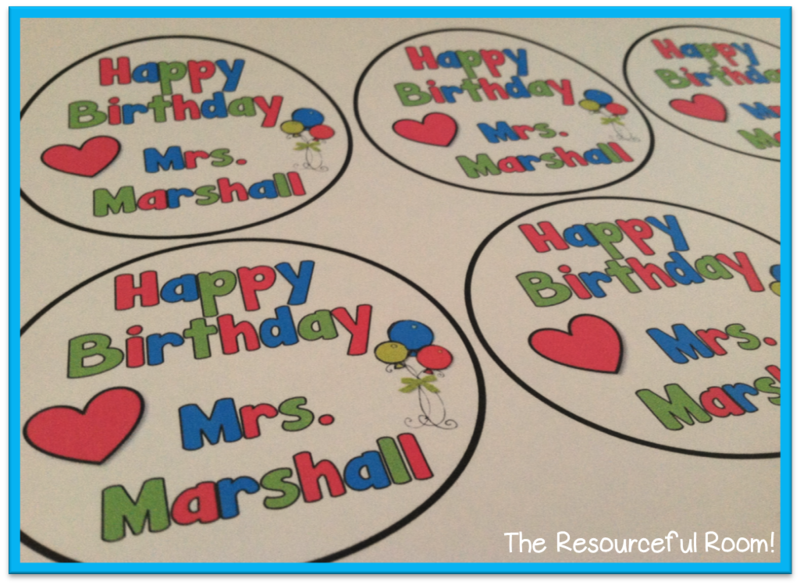 You can also use as necklaces and write each student's name and age in the space before the teacher name (make the teacher's name font smaller). The kids love it! Monday Made it Week 3!! My First Monday Made It of the Summer!